The historic Chief Theater of Bemidji, Minnesota is a refurbished Art Deco movie house that now serves as a top performance venue for the arts community of north-central Minnesota. Its primary tenant is the Paul Bunyan Playhouse, the oldest continuously-running summer stock theater company in Minnesota. Evensen Creative was tasked with developing a new identity for the Chief, which utilizes the typography of the Chief's existing marquee, a vintage piece that remains as visually powerful and distinctive now as it did when it was built. The project included a new web presence for the Chief, intended to swallow that of the Paul Bunyan Playhouse. Care was taken to ensure the site was well-organized, clear, and easy to navigate, with prominent calls to action for purchases and donations. Photographs of performances were heavily emphasized, as well as custom photography of the building and region. Together, these elements combine to present a story to the public of romance, warm summer nights, and live entertainment. They offer a promise of nightlife, something relatively absent in this college town aside from campus bars and lake sports. And they provide a central repository for the various theater troupes, musical acts, and entertainers who take turns to occupy the historic Chief Theater, giving them more visibility and allowing them to become a part of a community. The Center for Clinical and Translational Science (CCTS), is a high profile part of the Ohio State University Medical Center funded by a grant from the National Institutes of Health (NIH). The mission of the center is to take medical research and make it medical practice. 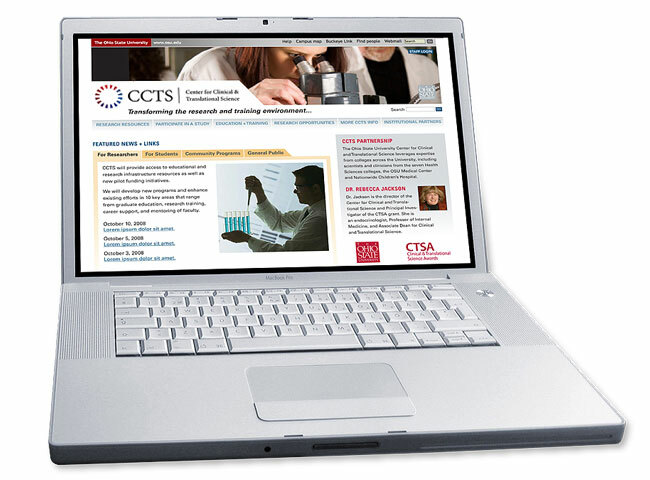 CCTS serves a diverse group of users, from medical researchers to government officials, all with equally diverse needs and goals. We were tasked with developing and designing a website guideline document for the center's developers to use when creating and maintaining the website. An array of user personas were developed to help the CCTS team understand whom they needed to support. From there, we developed an appropriate site architecture, page-type wireframes and visual guidelines for the site. The Found Footage Festival is a one-of-a-kind event that showcases footage from videos that were found at garage sales and thrift stores and in warehouses and dumpsters across the country. The show has toured across the US, Canada, and the UK and appeared at the HBO Comedy Festival and the Just For Laughs Festival in Montreal. 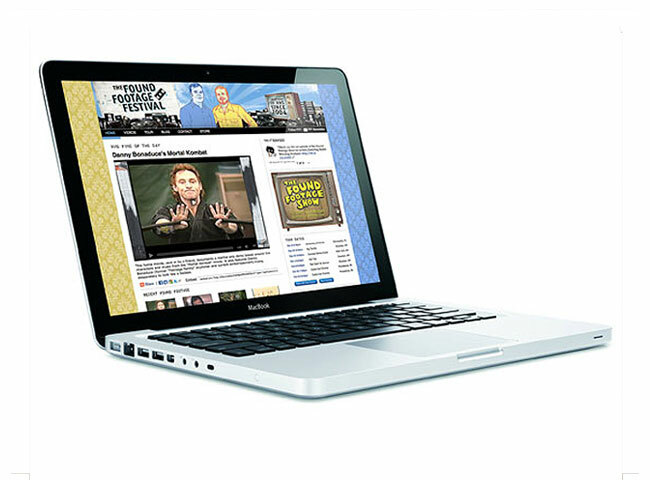 The FFF has been featured on National Public Radio, Jimmy Kimmel Live, and G4 TV’s Attack Of The Show, and has been named a critic’s pick in dozens of publications, including The Village Voice, Los Angeles Times, San Francisco Chronicle, AVClub.com, The Stranger, and The Chicago Tribune. This website was created using Drupal, and features daily-updated video content, a tour calendar, and an e-commerce engine. It was designed to fit with the Found Footage Festival's "scavenged" aesthetic. Illustration + character design for Captivate Network's interactive elevator display system and print promotional campaign. 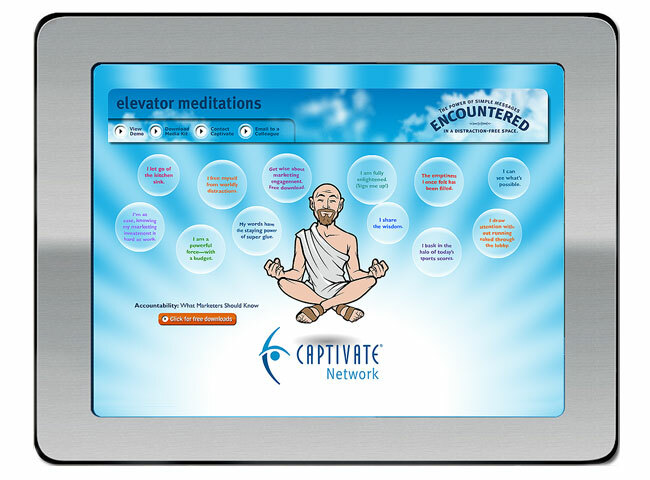 Captivate Network develops the hardware and software to enable advertising on display screens inside elevators of office towers throughout North America to provide news, entertainment and advertising to 2 million viewers who go up and down those buildings. Captivate Network was founded in 1999 and runs ads from hundreds of brands including McDonalds, Microsoft, Visa, BMW, Kodak and Universal Studios, broadcasting from 7am to 7pm. Structural Graphics produced several interactive direct mail pieces for this campaign, and the Boston Group developed the interactive elevator display. Who is that in front of the orchestra, waving that stick around? This project attempts to communicate, through demonstration and interaction, the role of the conductor of an ensemble. It leverages successful concepts from music-based interactive games such as Dance Dance Revolution, Donkey Konga, Guitar Hero, and Rock Band, as well as a very scaled down abstraction of conducting pedagogy, to create an engaging educational experience for all ages. It uses research on interactivity, educational tools, game design theory, and the design of fun experiences to create something engaging and informative. 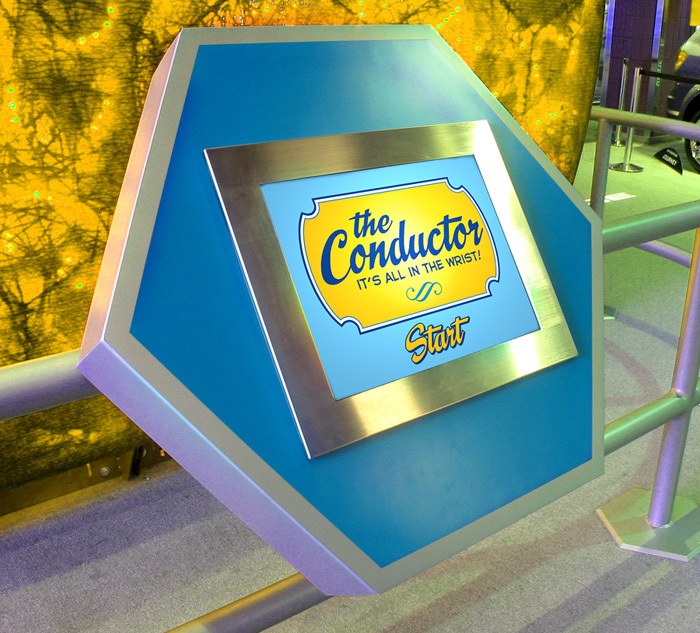 The kiosk was a proposed piece to be placed in concert halls for professional orchestras and wind ensembles, as well as in the music departments of colleges and universities.